According to Wikipedia, The Navy's USS Compass Island was one of two ships, the other being USS Observation Island, converted and classified as navigational research test vessels under the Polaris Missile system budget. As reported here, the newfangled radio sextant tracks the position of the sun or moon to provide location accuracy much better than the best traditional compass. 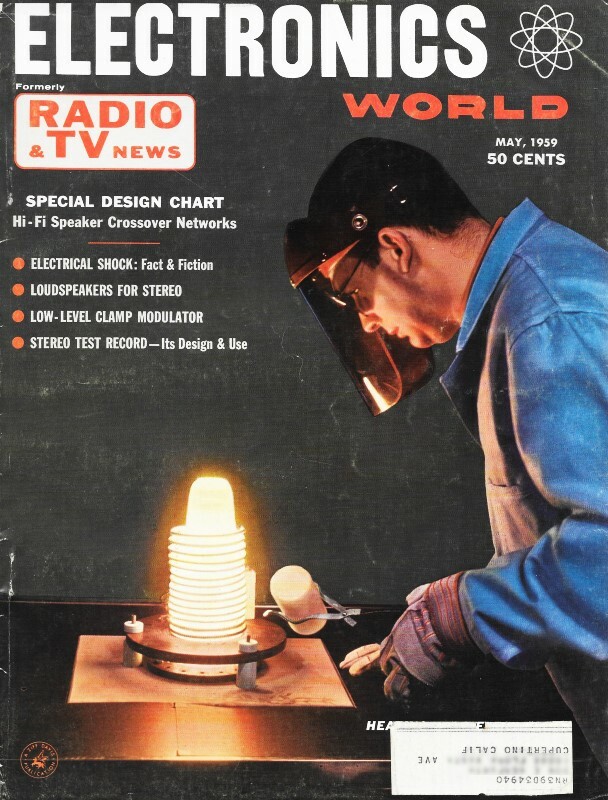 Remember that in 1959 there was no satellite navigation, and in the middle of the ocean land-based transmitters were useless as radio bearing references. Inertial navigation systems could not hold their calibrations in the harsh physical environment of stormy seas. This radio sextant system is fine as long as the sun and/or moon is high enough in the sky to have antenna pointing access to one or the other, but there are times where neither is available at nighttime because the moon and sun are in close angular proximity in the sky (aka the new moon). The USS Compass Island was decommissioned in 1980. 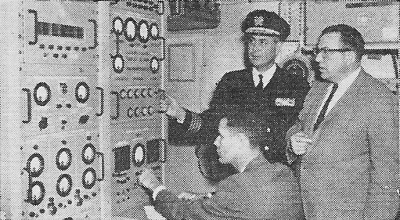 Control console aboard navigation ship. New precision instrument aboard Navy experimental navigation ship has ten times the accuracy of present marine compasses. For the first time in history, the moon has been tracked continuously by radio through the use of a new precision radio sextant designed and constructed by Collins Radio Company. The new radio sextant has been delivered and installed aboard the Navy's experimental navigation ship, the USS "Compass Island," where it is used in navigation research. The unit is also used to track the sun and such tracking is possible even under foul weather conditions. In addition, the sextant functions as a precise compass, furnishing the direction of north with more than ten times the accuracy of present marine compasses. The instrument utilizes a 5-foot parabolic antenna connected to an extremely sensitive radio receiver that measures the thermal radiation in the short microwave region. Operation is at a wavelength of 1.8 centimeters (about 16,500 mc.). A new tracking system involving advanced servo techniques is used. A special remote angle readout system, which can punch its data directly on cards with great precision, is part of the installation. It is also possible to control and check all phases of operation from a remote-control console. From a mechanical standpoint, machining processes with tolerances as small as 25 millionths of an inch were required, and new procedures for optical alignment were worked out. In order to provide the necessary mechanical precision, an air conditioning and heating system is used to maintain the equipment at a constant temperature at all times. 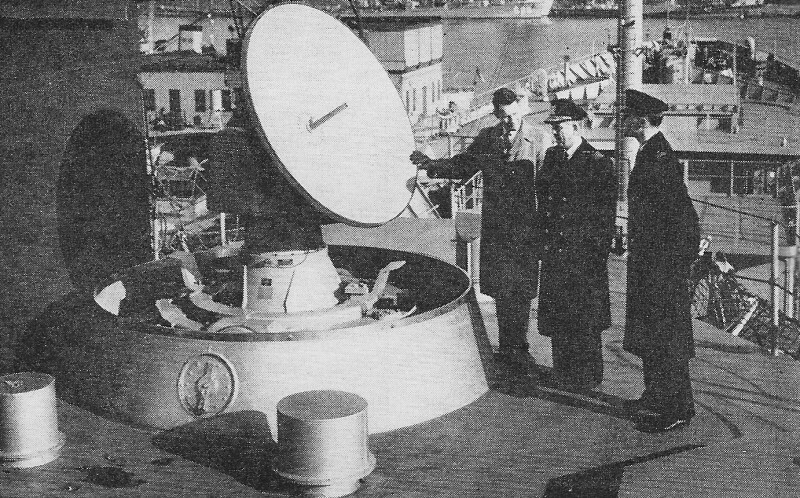 Antenna system of the AN/SRN-4 radio sextant installed on the USS "Compass Island." 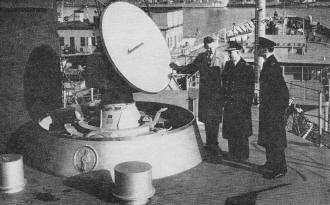 Aboard the USS "Compass Island," radio sextant observational data is coupled with the vessel's precision time standard and presented directly to a navigational computer. This then combines celestial and inertial data to determine the ship's location and true north. The sextant operates by picking up radiation from the moon or sun. Such radiation fluctuates in the same fashion as the Johnson noise from a resistor, making detection of the weak signal difficult. In this instrument, the antenna scans a circle around the sun or moon's rim. If the antenna is pointed directly at the sun or moon, the received signal will show no modulation at the scanning frequency, but if the antenna is displaced slightly, the moon or sun signal will be modulated. Phase-sensitive detectors derive error voltages which are used to make the radio sextant's antenna track the sun or moon. The use of other heavenly bodies, such as radio stars, is presently very difficult with practical size receiving equipment. These stars produce extremely weak radiation in a much longer wavelength portion of the microwave region so that high resolving power is difficult to achieve with reasonably compact equipment of the type described above.